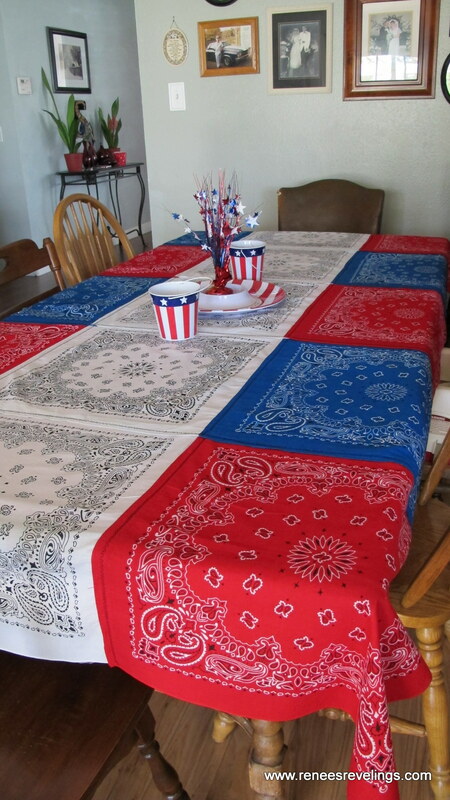 My dining room table needed a splash of red, white, and blue for the summer holidays. I had been searching for a tablecloth for a while and could not find anything that I liked. It took a trip to Hobby Lobby and taking the time to search through their ideas in the store for me to find “The One“. My old dining room table is very long, can seat up to 10 people comfortably, and needed a big tablecloth. I finally had a chance to make one this past summer from some colorful bandannas. 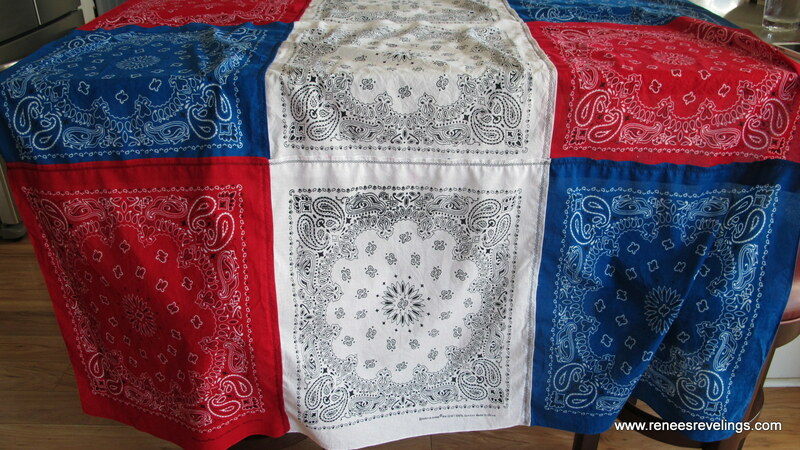 First I bought 15 bandannas; 5 red, 5 white, and 5 blue. Next I washed and dried the bandannas to pre-wash them just like you would with any new fabric project. 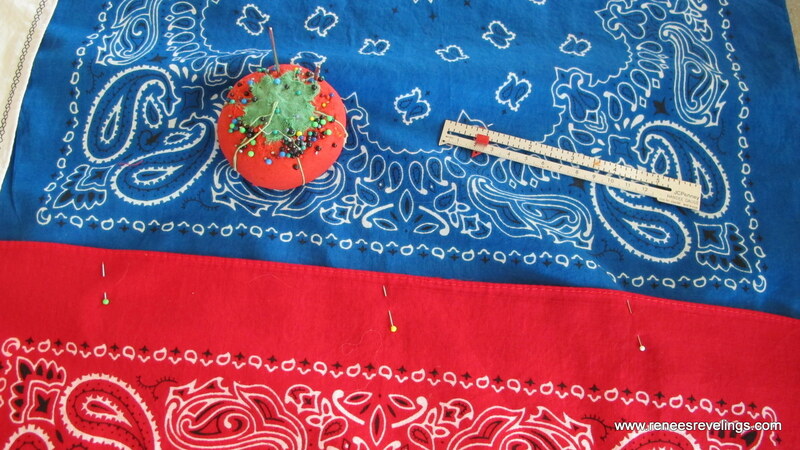 Next came the task of the pattern of the bandannas. How did I want to lay them out? My layout needed to be 3 bandannas wide by 5 bandannas long. I actually drew up a few ideas on the computer, because I thought I wanted to have them be somewhat abstract, but in some sort of pattern too. Does that make any sense? In the end I decided that I would do a row of one color right down the middle. On my long table this made it appear like a table runner. And then I alternated the colors on the other two long rows. 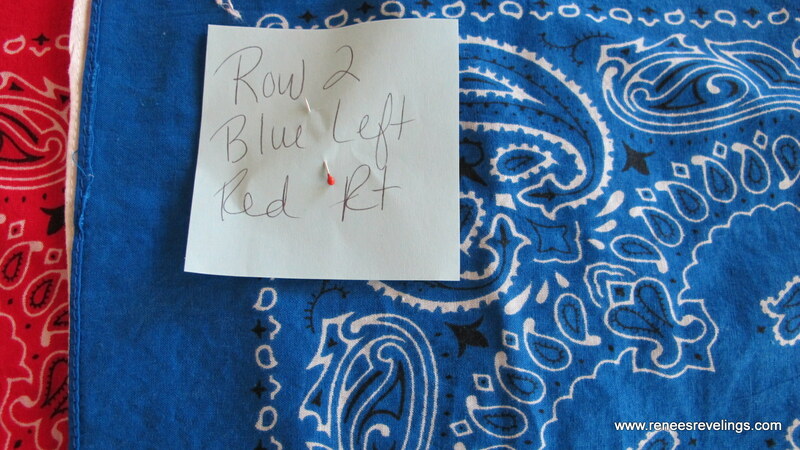 I laid all of the bandannas out on the floor, and then picked up each row (3 across), pinned them together in the order I would stitch them together, and marked the row number with a post-it-note. I did not do a traditional seam for the bandannas I overlapped the edges about a half-inch and then did a decorative zig-zag stitch that would show on the top of the tablecloth. First I sewed three of them together, just like the picture shown below. This would create the table width. Then once I had all five rows completed, I stitched the rows together, being careful to match the seams of the previously stitched row. This stitching keeps everything in line, and looks much better on the table too. This created the length of the tablecloth. Once all of the stitching was done I washed and dried the tablecloth again the help the squares lay flat and stay in place. I did have to do a bit of ironing too for all the stitching to lay flat. Here is my finished work. The table did look lovely. I was quite pleased with the end result. This tablecloth will be around for the patriotic holidays (or just all summer long) for many years to come. It is great that it is completely washable. When there’s a party at the house I don’t worry about the occasional spill or what not. I just know that I can toss it in the washer and dryer. But, it does require a little touch up ironing once it is done in the dryer. That’s alright with me though, because it is such a wonderful conversation piece. Now that I have this tablecloth completed I’m thinking I may do the same thing with fall colors, or maybe one that is just Christmas colors. This project was a lot of fun, and did not take long to put together once I decide on the pattern. I would definitely make another one. So cute, Renee! Very summery!